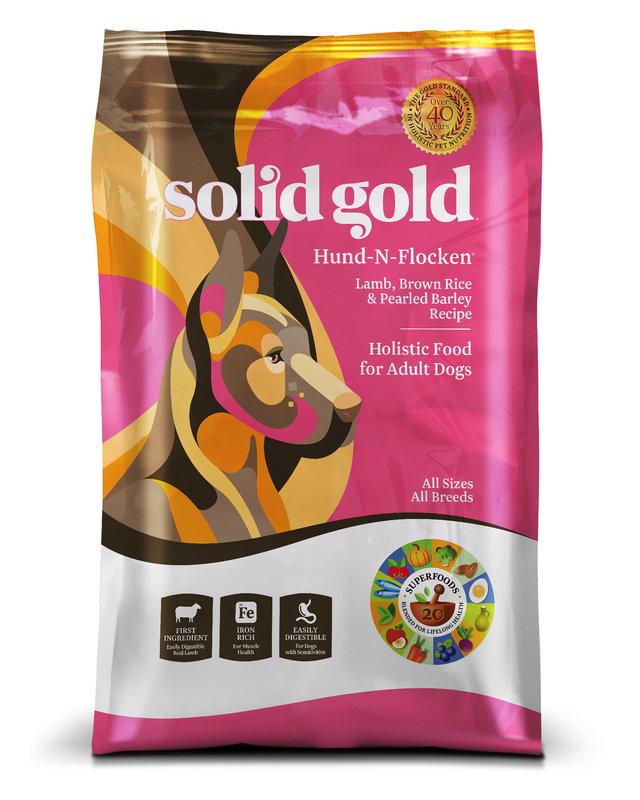 Hund-N-Flocken is the first dog food Solid Gold ever crafted and has a special place in the hearts of Solid Gold fans! The holistic and natural ingredients (and the funny-sounding name) were inspired by Solid Gold founder Sissy McGill. Your dog will feast on tender, delicious lamb. Every bowl is a well-balanced meal packed with high-density protein and whole grain brown rice. Every dog deserves a food that does more than fill their belly. This one will unleash their inner gold! Ideal for medium to large moderately active adult dogs. Made with tender, delicious lamb to provide a well-balanced meal packed with high-density protein. Crafted with Lamb, Brown Rice, Pearled Barley, Oatmeal and other wholesome and nutritious ingredients. Ingredients: Lamb, Lamb Meal, Brown Rice, Pearled Barley, Oatmeal, Peas, Rice Bran, Ocean Fish Meal, Canola Oil (preserved with mixed Tocopherols), Dried Eggs, Natural Flavors, Flaxseed, Tomato Pomace, DL-Methionine, Choline Chloride, Potassium Chloride, Salmon Oil (preserved with mixed Tocopherols), Taurine, Dried Chicory Root, L-Carnitine, Carrots, Pumpkin, Apples, Cranberries, Blueberries, Broccoli, Parsley, Spearmint, Almond Oil (preserved with mixed Tocopherols), Sesame Oil (preserved with mixed Tocopherols), Yucca Schidigera Extract, Dried Kelp, Thyme, Lentils, Vitamin A Supplement, Vitamin D3 Supplement, Vitamin E Supplement, Zinc Sulfate, Niacin, Ferrous Sulfate, L-Ascorbyl-2-Polyphosphate (Source of Vitamin C), Calcium Pantothenate, Thiamine Mononitrate, Copper Sulfate, Riboflavin, Pyridoxine Hydrochloride, Manganese Sulfate, Zinc Proteinate, Folic Acid, Calcium Iodate, Manganese Proteinate, Copper Proteinate, Sodium Selenite, Biotin, Vitamin B12 Supplement, Rosemary Extract, Dried Lactobacillus Acidophilus Fermentation Product, Dried Enterococcus Faecium Fermentation Product, Dried Lactobacillus Casei Fermentation Product.